Somethings are better than the original. Pumpkin Fettuccine is better than regular Fettuccine. The Life of Pi movie was slightly better than the book. This pot-pie is head and shoulders better than a traditional pot-pie. This month’s Recipe Redux theme: A healthy recipe inspired by this year’s Oscar Picks. With so many options to choose from, it was hard to pick just one. 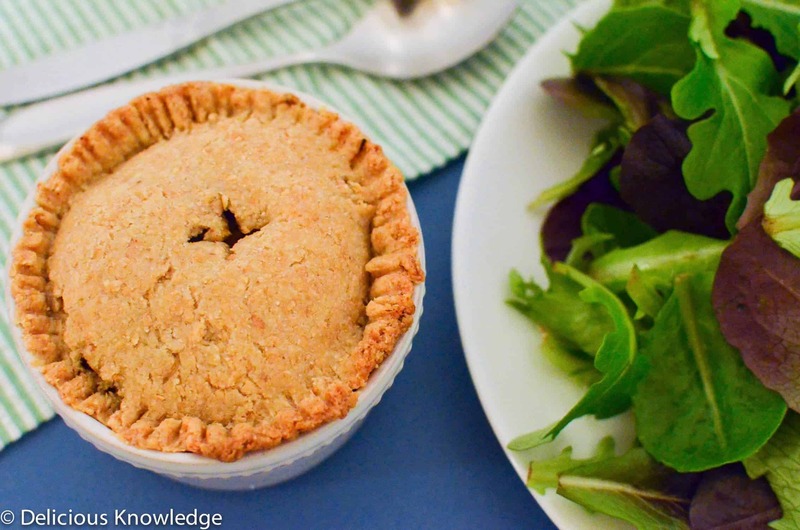 This Life of Pi imagined dish combines a literal pie with a hearty, Indian filling. Or as I like to call is: Samosa Pot Pie. 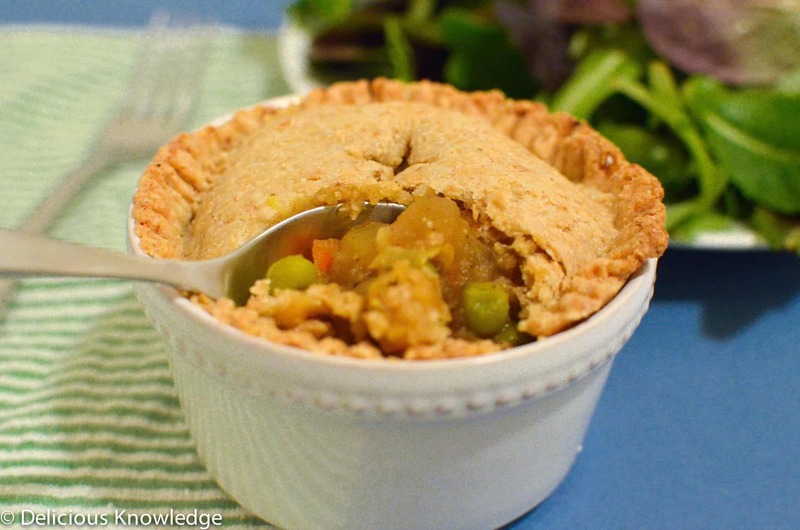 Spicy, hearty filling of peas, potatoes, cauliflower, and carrots topped with a flaky whole-wheat crust. 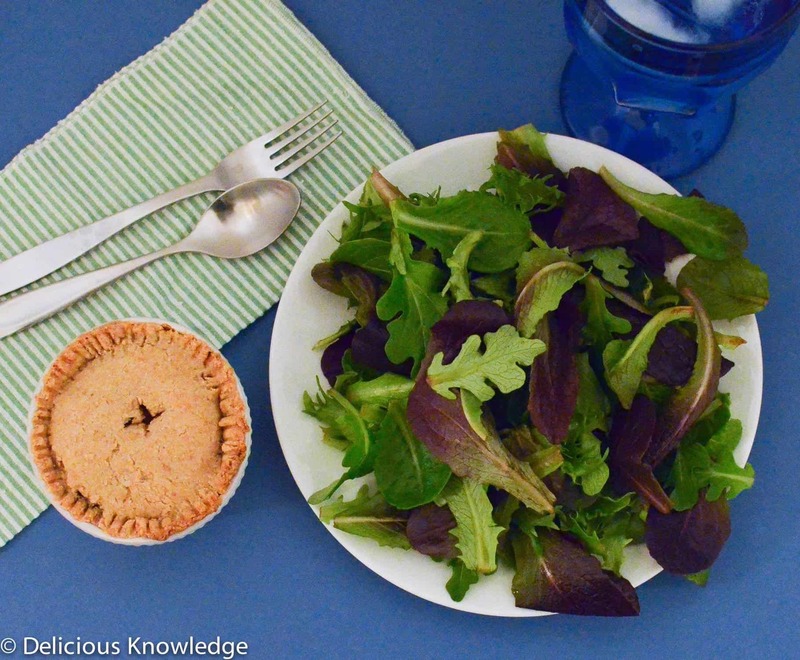 And much healthier than traditional pie, to boot. Anyone that knows me understands that Oscar night is a big deal in our house. I can’t remember when we first started betting on picks, but it’s become quite the tradition, one we look forward to for weeks. The day of the Oscars BL and I bet on various categories, one picking a winner the other taking the field, to up the ante while watching the festivities. I guess this is what a competitive couple does for fun? But what would a night of gambling be without a spread of delicious food? We each usually bring 2-3 items that we can snack on: dips, desserts, my Oscar star cookies, and of course champagne! Because that’s exactly what a competitive couple who also loves food does for fun. This year, I am going to bring these. A fun twist on my favorite appetizer, the samosa, baked into a miniature pot pie. We already established that mini versions of our favorite foods were better than the original, and this pie is no exception. However you celebrate Oscar night, be sure to check out all of the Oscar-inspired recipes in the Redux Roundup below. Cross your fingers that I win! Place flour and salt into a mixing bowl. Using a pastry beater, mix together the flour and salt. Drop small peices of butter into the bowl, one at a time and mix until small peas of dough form, Add water, one tablespoon at a time until dough forms. Form dough into a ball and press each into a disc shape. Wrap plastic wrap and refrigerate for 30 minutes before rolling. Heat coconut oil over medium heat. Add onion and minced garlic. Cook, stirring often, until onions are translucent, about 5 minutes. Add the cubed potatoes and 3/4 cup vegetable broth. Bring heat to medium-high and cook until potatoes are tender, about 10-15 minutes. Using a potato masher, mash potatoes until they resemble chunky mashed potatoes. Add the carrots, cauliflower and spices. Add the remaining vegetable broth and simmer for 15 minutes until thickened. Add agave nectar, lime juice, and frozen peas. Stir together. Season with salt, to taste. Place filling into greased ramekins or pie plate. Roll the dough out until ~1/2″ thick. 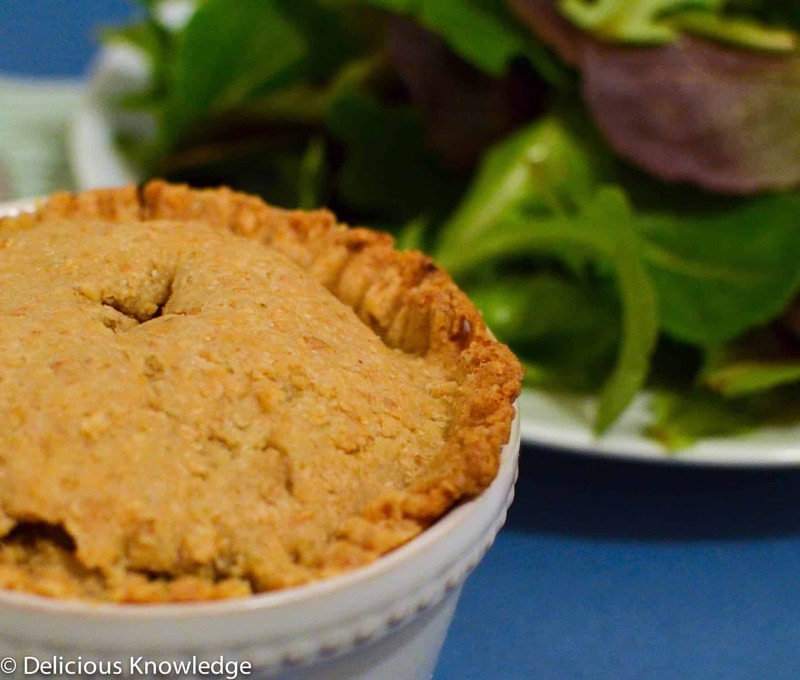 If using a pie plate, place the dough on top and crimp the edges. If using individual ramekins, cut a circle slightly larger than the ramekin. Place on top and crimp the edges with a fork until sealed. Make a small X on top to let steam escape. Combine the melted butter and soy milk. Lightly brush tops with the butter-milk mixture. My husband is literally obsessed with pot pie. 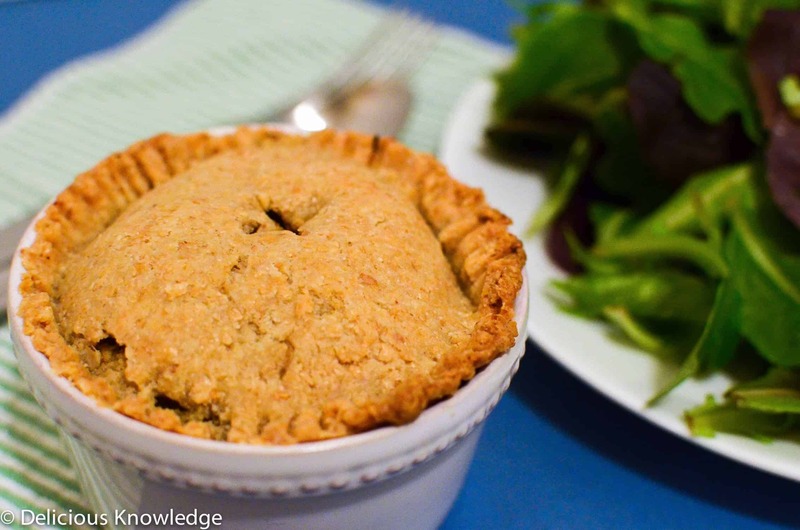 I tried a pot pie soup recently for a healthier version, but I must try this crust next! You’re absolutely right – mini is somehow always better than original full-size! I’d love to try these; they mix some of my favorite ingredients & flavors. I love samosas and love pot pie, but never would’ve thought to combine them. What a great idea! This is so creative! I can’t wait to try this. I love Indian food and the fusion with a very traditional American dish is very cool. Thanks for sharing! 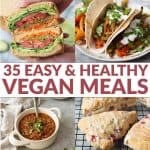 I was perusing the internet for something different and something I could veganize. 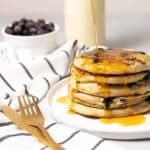 I came upon this recipe. Since we love samosas, I thought why not? What a delicious and different take on a samosa. It’s fabulous! This recipe goes in my files as one I will make several times this winter. Awesome! So happy to hear it. Glad you enjoyed it!